Shriek is a fictional character, a supervillainess appearing in American comic books published by Marvel Comics. She is usually depicted as an enemy of Spider-Man, and the lover of Cletus Kasady. Shriek first appeared in Spider-Man Unlimited Volume 1, #1 (May 1993) and was created by Tom DeFalco, Mike W. Barr, Terry Kavanagh, Ron Lim, Jerry Bingham, and Mark Bagley. Shriek is a dangerous and criminally insane villainess with the ability to manipulate sound. During the events of Maximum Carnage, she allied herself with Carnage and several other supervillains who went about New York on a killing spree. Shriek's origins and real name were, at first, uncertain. She was named Sandra Deel in her earliest appearances, but named Frances Louise Barrison in later appearances. According to the Spider-Man Encyclopedia, she was born Frances Louise Barrison, but used Sandra Deel as an alias. During her childhood, Frances was abused by her mother for being overweight, driving her to drugs and leading to her later fixation on becoming a mother herself. She became a drug dealer, which exposed her to situations that ultimately damaged her sanity; namely, being shot in the head by a police officer, and being put in Cloak's dark dimension, which gave Shriek her abilities. Shriek debuted at the start of the Maximum Carnage crossover. During Carnage's violent escape from the Ravencroft mental institution, he came across Shriek, who was also incarcerated and wished to join him. He freed her, and the pair embarked on a killing spree. They attracted the company of several other homicidal supervillains (Demogoblin, Doppelganger, and Carrion), and formed a "family," with Carnage and Shriek as the "parents" and the others as their "sons". (Although it is clearly obvious that Shriek had love for Carnage, it is uncertain whether he felt the same for her; it is implied many times that he did.) Shriek also used her mental powers to increase the chaos by causing a number of New Yorkers to violently turn on one another, although the heroes were able to calm the people down before they did anything too serious, such as killing their own children. The killers fought a number of heroes, led by Spider-Man, but succumbed to in-fighting. Carnage slew the Doppelganger and left the others to their defeat and capture, although he was subsequently contained by the Avengers after a clash with Spider-Man, Venom and Black Cat. In the aftermath, Shriek is returned to Ravencroft, but escapes her cell by short-circuiting her power dampening unit. Shriek frees fellow inmates Gale, Webber, Pyromania, and Mayhem, and together they try to break out of the facility, opposed by Spider-Man and John Jameson. While distracted by Spider-Man, Shriek is knocked out with a tranquilizer gun by Jameson. Carrion and Shriek in The Amazing Spider-Man #392. Art by Mark Bagley. When Dr. Ashley Kafka brings Malcolm McBride near Shriek's cell, Shriek recognizes Malcolm as her "son" Carrion, breaks out of her room, and escapes from Ravencroft with Malcolm. Agitated by Malcolm's refusal to acknowledge her as his mother, Shriek becomes violent towards him, and uses her powers to turn him back into Carrion after an encounter with Spider-Man, who Shriek plans on making her new "husband" after sensing a growing darkness within him. In an attempt to make Carrion fully embrace her as his mother, Shriek takes him to Beatrice McBride, the biological mother of Malcolm, with the intent of having Carrion murder the woman. The duo are tracked by Spider-Man, and in the ensuing brawl, Shriek abandons her plans to convert Spider-Man to her side, and forces Carrion to choose between her and Beatrice. The distraught Carrion instead begins to commit suicide with his own powers, which Beatrice tries to stop, stating, "Do you think my life matters? Do you think I wouldn't sacrifice myself a thousand times over to save my child?" when Shriek tells her that she will be killed by contact with Carrion. Touched, Shriek absorbs the Carrion virus, incapacitating herself, and turning Carrion back into Malcolm. Shriek is readmitted to Ravencroft, where the dormant Carrion virus (which she had been treating like an unborn child) is extracted from her by the Jackal. Later, Shriek is brought on as a juror in Judas Traveller's mock trial of Spider-Man in the basement of Ravencroft. Shriek and the other members of the jury deem Spider-Man guilty of ruining lives and creating supervillains, but before they can execute their sentence of death they are returned to their cells and have their memories altered by Traveller. The symbiote-enhanced Shriek in Carnage #4. Art by Clayton Crain. She appears in Brand New Day as one of the villains in the Bar With No Name. After Carnage is returned to Earth by Hall Industries, the company purchases Ravencroft with the intention of using Shriek (who had been responding well to the treatment being administered to her by Doctor Tanis Nieves) as a power source for the Carnage symbiote, which had been separated from Cletus Kasady. Shriek is brought to Hall Industries, where exposure to the Carnage symbiote, coupled with her witnessing guards beating Doppelganger (who had been attempting to rescue her) causes her to snap, and return to homicidal mania. After Cletus reunites with his symbiote, Shriek and Doppelganger aid him in causing chaos throughout New York City, with Shriek gaining additional powers from another symbiote (which gives her a third arm, and covers half of her face) that Carnage's had spawned. 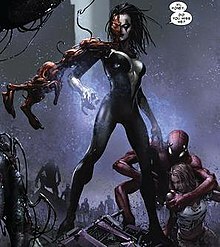 Growing fearful of Shriek, the symbiote leaves her in favor of Nieves, its initial host, to create Scorn, who forces Shriek to use her powers to weaken Carnage, allowing Spider-Man and Iron Man to defeat him. In the aftermath, Shriek is shown to be in a coma, Scorn having done some unspecified damage to her brain. Shriek regains consciousness, and is recruited by Caroline le Fay to battle the Fearless Defenders as a member of the new Doom Maidens. After the Doom Maidens are disbanded, Shriek reunites with Carnage, and saves him from Deadpool in Tulsa, Oklahoma. The two killers flee pursued by Deadpool, who crashes their car with a combine harvester, severely injuring Shriek, and enraging Carnage. Carnage flings Deadpool away, and escapes to the base of the Mercury Team (who he kills) with the unconscious Shriek. Carnage, troubled by Deadpool making him question his nihilistic beliefs, then has Shriek help him break into a psychiatric hospital, where they try to force the patients and staff to answer Carnage's questions about being controlled by higher powers, a concept which disgusts Carnage. Deadpool, who has bonded to the Mercury Team's symbiotes, uses his new shapeshifting abilities to disorient Shriek, causing her to run off. After a skirmish with Carnage, Deadpool captures Shriek, uses his symbiotes to disguise her as himself, and tricks the already distraught Carnage into nearly killing her, causing Carnage (who believes his attacking Shriek was "foreshadowed" by the higher powers) to suffer a mental breakdown. Shriek is hospitalized, and Carnage willingly allows himself to be arrested. Shriek recovered, and was hired onto the Sinister Sixteen by Boomerang and the Owl. After being manipulated and abandoned by Boomerang, Shriek and three other members of the Sinister Sixteen sought revenge on him in the Bar With No Name, only to be defeated by him, Beetle, Overdrive, and Speed Demon. Shriek subsequently attacks a police station with Gibbon, Griffin, and Ruby Thursday. The quartet is subdued by Spider-Woman's apprentice Porcupine. Detroit-based supervillain Nain Rouge afterward hires Shriek and a new Firebrand to be his enforcers, bringing them into conflict with the Great Lakes Avengers. Shriek later appeared as a secret ally to Kraven the Hunter at the time he was leading the NYPD's SWAT Team into hunting the Dinosaur People living beneath New York City ever since they were created by Stegron. She made herself known where she used her sonic attack on Venom and then collapsed the ceiling on him much to Kraven the Hunter's annoyance. Shriek stated to Kraven that he can have the head of Eddie Brock after their mission. Venom catches up to Kraven the Hunter and fights him and Shriek. With help from Tana, Venom stated that the Dinosaur People weren't killing anybody and that they are only surviving underground. Kraven the Hunter and Shriek are arrested by the NYPD. Shriek eventually reunites with Carnage and Doppelganger again and together formed a cult dedicated in worshiping Knull. They eventually return to Doverton and got the codexes–the symbiote remnants left on the bodies of previous hosts–from the citizens who were infected by Carnage. Being a mutant and following exposure to Cloak's Darkforce Dimension, Shriek has the ability to manipulate sound in a number of elaborate ways. She can harness it for destructive concussive force or use it to disorient and agitate her enemies. She can apparently hypersonically induce intense emotion in those around her (generating fear, hate, or despair). She also has moderate powers of levitation that she can use to make herself fly and possibly some low level of psionic ability. She is able to sense the darkest side to a person's psyche so that she can use her powers to specifically manipulate that person's emotions. Her scarred left eye is also prone to glow whenever she uses her powers. Why only that eye glows is uncertain. Shriek appears in Ultimate Spider-Man vs. The Sinister Six, voiced by Ashley Eckstein. She has a non-voiced appearance in the episode "Anti-Venom" when Spider-Man and Agent Venom defeat Shriek at the time when Doctor Octopus was looking for members for the Hydra-backed Sinister Six. In "The New Sinister 6" [Pt. 1], Shriek robs a bank when Spider-Man was bringing a cake for May Parker's birthday party. Spider-Man had to be careful not to have the cake ruined while fighting Shriek. Spider-Man managed to defeat Shriek by knocking her into a hot dog cart. But there was a mix-up where Spider-Man accidentally grabbed the bag containing the stolen money instead of the bag containing the cake. In "The Symbiote Saga" [Pt. 2], Shriek is among the civilians infected with the fragmented Carnage symbiote. The Carnage symbiote on her is neutralized by the Anti-Venom symbiote. 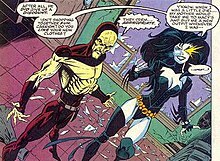 Shriek was among the boss characters that appeared in Spider-Man and Venom: Maximum Carnage, which was based on the story-arc that she was a part of. Shriek appears as one of the minor villains for the Spider-Man 3 video game, voiced by Courtenay Taylor. In the game's Wii, PS2, and PSP versions, she is married to Dr. Michael Morbius. Her powers were given to her by a symbiote similar to Spider-Man's black suit. She is first mentioned by Dr. Morbius as the one who caused his need to feed on blood, but mentions that when she did it to him she was "not herself" and that she had been "changed". She uses her psychic powers to influence New York's citizens to do multiple things (like being her "children" or alternatively making them walk into toxic gas and stay). She puts a large pillar on top of a building and attaches multiple meteorites to it, from which she could draw power. Spider-Man succeeds in pulling all the meteorites off of the pillar and Shriek in turn flees. Later Spider-Man brings Morbius to Shriek's hideout, and Dr. Morbius demands to know what Shriek did to Morbius; Shriek says she released a special blood in the lab that infected Dr. Morbius (although she had not meant this to hurt him.) She uses her psychic powers to force Morbius to fight Spider-Man, as well as to shut the windows so the sunlight could not hurt Dr. Morbius. Spider-Man defeats Dr. Morbius and Shriek flees deeper into her hideout. Shriek employs psychological warfare on Spider-Man, urging the hero to use his powers for personal benefit. She also creates illusionary duplicates of Mary Jane Watson, J. Jonah Jameson, Curt Conners and Harry Osborn to combat the wall-crawler. Spider-Man soon realizes that both Shriek's powers and the black suit come from the same source, and he uses the black suit to make Shriek appear, and in turn defeats her. Spider-Man brings Shriek to Dr. Connors and Dr. Morbius to discover if she can be cured of her condition. ^ Web of Venom Cult of Carnage #1. Marvel Comics. ^ "The New Sinister 6: Part 1". Ultimate Spider-Man. Season 4. Episode 10. June 12, 2016. Disney XD.